We love Yellowstone. The world’s first national park is full of geologic splendors. There are bubbling mud pots. Technicolor springs. Geysers galore. As cool as all of these things are, they don’t make for the most exciting or dramatic hiking. Yellowstone hikes are pretty. Peaceful. Relaxing. Interesting. But we’ve rarely stopped in the middle of a Yellowstone hike to pick our jaws up off the ground though. Neither have we ever stopped in Yellowstone to take a 360-degree panoramic photo. The 20 miles of the Sky Rim Trail, in the far northwestern part of the park, breaks this trend. The panoramic beauty here is simply staggering. The first and last six-ish miles of the Sky Rim Trail are in the forest, but the heart of the adventure is a seven-mile traverse of an undulating ridge between Daly Pass and Big Horn Peak. This ridge is the northwest boundary of the park. 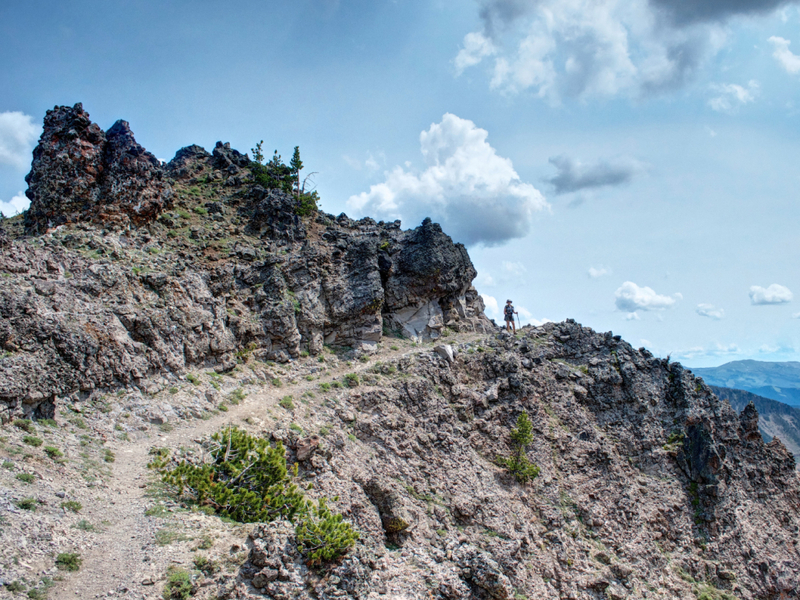 The Sky Rim Trail is unlike any other trail in Yellowstone. If you’re already planning on visiting Yellowstone from Jackson Hole, you should put this on your list. If you’re not already planning on visiting Yellowstone, you should consider visiting just to do this hike, whether as a long day or an overnight. Start from the Daly Creek Trailhead outside of West Yellowstone. The first several miles don’t hint at the awesome-ness to come, as the trail wanders through grassy meadows. From Daly Pass, it’s less than a mile to the ridge that gives this trail its name. At this two-way Sky Rim junction, 0.8 miles past the Daly Pass junction, you have to pay a bit of attention. A Sky Rim trail heads north into the Buffalo Horn area of the Gallatin National Forest in addition to the Sky Rim Trail that heads southeast and stays just inside Yellowstone. 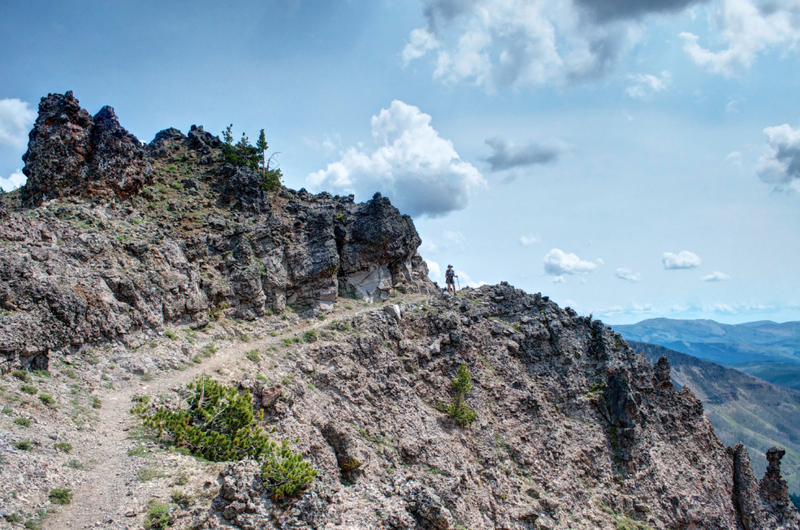 Take a right at this junction for the Yellowstone Sky Rim Trail. NOTE: Once you leave the Daly Creek meadows, there is no water available until mile 16 or so. Also know that, like most mountain ridges, the Sky Rim offers little protection or escape from inclement weather. If thunderstorms are looming, it might be wise to do this another day. Once on the ridge, the trail is not as beaten-in as it is down lower, but, even in the one instance it completely disappears, there’s little danger of getting lost. For most of its length the ridge is no more than 200 feet wide. (In many instances it’s much narrower.) Stay on the ridge and you’ll be fine. As you traverse the ridge, there are half-a-dozen (or so) ups and downs. None of these are more than 400 feet. Except the final one, which is 500 feet. Traveling the ridge, you’ve got 360-degree views. You can see the Gallatin Range. Also the Absarokas. Looking way behind you and you can see The Sphinx in the Madison Range. The final lump in the ridge is the toughest, both because of its vert, its steepness, and its loose-ness. 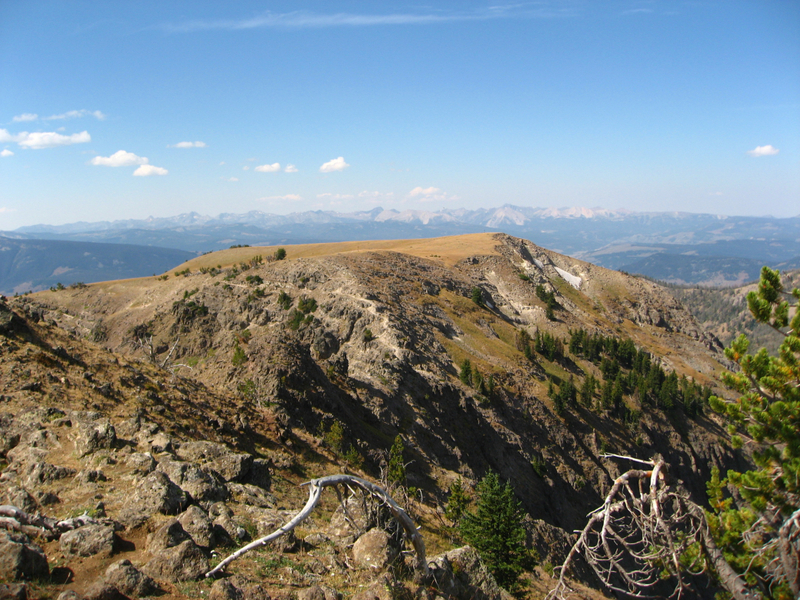 You can stop in the large grassy field above this hillside, but the .3-mile trip to the actual summit of Big Horn Peak is very much worth the effort. Not only is the trail itself a feat of engineering and execution—it really is carved out of the peak’s crumbly, cliffy side—but you get expansive views back on the ridge you just traversed. To return to the trailhead, descend down into the Black Butte Creek drainage once you’ve retraced your steps to the final large grassy field. After you’ve descended for six-ish miles, take the Black Butte Cutoff Trail to get you back to Daly Creek. You’ll hit the trail you took in two miles from the trailhead parking lot. If you want to do this in a more leisurely fashion than in a single day, the camping at Shelf Lake (three miles, one-way from the summit of Big Horn Peak, via the Gallatin Skyline Trail) is great. Of course this will make your Sky Rim hike six miles longer. But there are plenty of worse things than that! Anyone who's in good hiking shape, loves sweeping panoramic views, and is seeking a Yellowstone adventure unlike any other.